The Soyuz spacecraft and launch vehicle, seen here at the Baikonur complex in Kazakhstan, was part of a cooperative mission between the US and the USSR. The Baikonur complex in Kazakhstan is the world's largest space center. In this historical photo from the U.S. space agency, the Soyuz spacecraft and launch vehicle are installed on the launch pad at Baikonur in 1975. 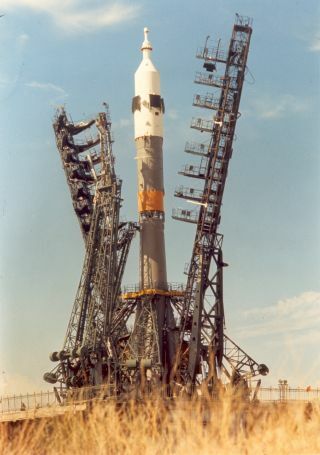 The launch was part of the Apollo-Soyuz Test Project (ASTP), a cooperation between NASA and the Soviets. The goals of ASTP were to test the ability of U.S. and USSR spacecraft to rendezvous and dock in space and to open the doors to possible international rescue missions and future collaboration on manned spaceflights. Given the high level of cooperation between Russia and America today, it’s easy to forget that during the Cold War, such cooperation was remarkable. Crews also performed in-flight intervehicular crew transfers and various scientific experiments. ASTP proved to be significant step toward improving international cooperation in space during the Cold War, according to NASA’s account of the mission. The Soyuz and Apollo crafts launched from Baikonur and the Kennedy Space Center respectively, on July 15, 1975. The two spacecraft completed the rendezvous and docking on July 17. While the Soyuz craft returned to Earth on July 21, the Apollo craft stayed in space three more days, dropping into the Pacific Ocean July 24.